The ready-to-eat cereals commend themselves to those whose time is money. For the house-mother whose chief business is housekeeping the uncooked cereals will make the greatest return for the money spent. A cent’s worth of oatmeal when cooked is as much as the very heartiest laboring man can eat. A cent’s worth of cornmeal makes a breakfast for him, and there will be some left to fry for supper. A cent’s worth of a ready-to-eat cereal is less – one shredded wheat biscuit or a dainty dish of corn flakes. The saving all depends upon the value of the cook’s time. For uncooked cereals she expends time in preparation, for the ready-to-eat cereals she expends money. True economy for one family may be extravagance for another family. The intelligent housewife considers all these facts in order to make a wise decision. 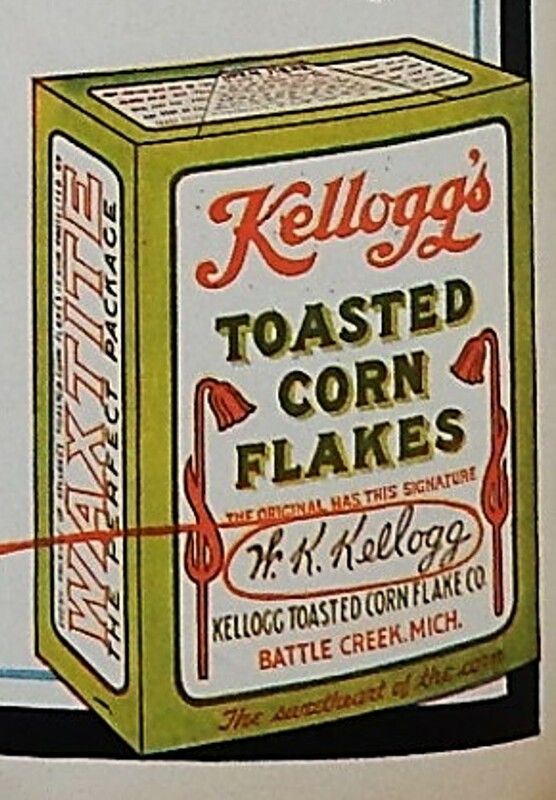 Wow, I had no idea that boxed cereal existed back then. That is fascinating. I wonder how common it was to eat it for breakfast? I think that ready-to-eat cereals were first invented in the late 1800s, and that they originally were considered a health food. My mother (born in 1926) told me that growing up in Quebec her mother cooked “porridge” ever morning, by which she meant oatmeal. When I was young she’d fix me breakfast every morning. My father always got up really early and he always had cold cereal, like cornflakes. As my mother was a pretty bad cook, as I aged and started getting up early myself I switched to cold cereal too and politely declined her offers to fix me breakfast. It’s interesting how the terminology we use to describe some foods has changed across the years. I seldom hear anyone say porridge anymore – unless they are talking about Goldilocks and the Three Bears. Family food preferences and traditions go from generation to generation – though, like you, each generation tweaks the foods to make it work for them. My daughter will eat it that way. She’ll pour cereal in a plastic bad and sit and eat it without milk. Eating my dry cereal from a box now. I’m glad to read about choices a hundred years ago. We have so many more now! Frankly, I cheat. In the summer we have cooked cereal uncooked. The night before, I stir together equal amounts of oatmeal and Greek yogurt and put it in the refrigerator. At the table we choose whatever we please to stir in — milk, sweetening, fresh fruit, dried fruit, nuts, flavorings, even chocolate! A hundred years ago my mother could have eaten that when she was two years old, if it had existed. I enjoy your findings. Please keep them coming! The method you use to make oatmeal sounds wonderful and so easy. It’s nice to hear that you enjoyed this post – and I definitely plan to keep them coming. I have a lot of fun doing this blog. I’m so fortunate to have great readers like you. It also made me realize how tight money must have been for some people back. Both hot cereals and cold cereals seem relatively inexpensive today. Cold cereal can also be used as an ingredient for some other food. I hardly ever do that, but I’ve seen it done lots of times. I wonder when that became common. My father used to occasionally heat chex mix in a pan, I suppose that’s basically frying it, using butter and then salt it. With ever changing dietary advice I don’t know if that’s horrible for you or harmless, but salted it tastes pretty good. My wife loves Rice Crispy treats, although I’m not super keen on them. She also makes “no bake” cookies that use raw oatmeal, and I do like those. You’ve described some of my favorite ways to use cereal. I like Rice Crispy treats, and those “no-bake” cookies with oatmeal, cocoa, and peanut butter are the best. It’s funny that everyone figures you must cook oatmeal, but you don’t have to. It can be eaten raw with milk. Raw with milk and brown sugar, or brown sugar and raisins, and it’s pretty good. When we have tubs of oats here (which I probably should buy more often), I’ll often eat it that way. Like you, I like raw oatmeal. I’d never serve it to anyone, but if I’m looking for an easy snack, raw oatmeal with milk, brown sugar, coconut, and nuts is delicious. I think the advice about factoring time into the true cost of preparing food is still true for today! I agree – I also find it fascinating how different people value their time in different ways. Speaking of cold cereal companies, I bumped into this interesting post about Mr. Post and Post Toasties. Thanks for sharing the link. Until I read it I didn’t know anything about the history of Post cereals – and I had no clue that Marjorie Merriweather Post was connected to the cereal industry. Have a wonderful long Labor Day week-end!